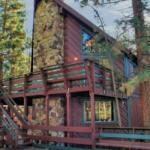 Heavenly Hideaway is set in South Lake Tahoe and offers barbecue facilities. Guests have a private patio. The holiday home includes a kitchen with an oven and a microwave as well as a coffee machine. A TV and DVD player are provided. Heavenly Ski Resort is a 14-minute walk from the holiday home. The nearest airport is Reno-Tahoe International Airport 65 km from the property.